In the bestselling tradition of Marley and Me, a funny, heartwarming and inspiring true story of how one adorable little pig changed her owners’ lives forever. When an old friend called animal lover Steve Jenkins and begged him to take in an adorable ‘micro’ piglet, he couldn’t say no. Although he knew his partner Derek would be far from thrilled about him adopting yet another stray, the idea of owning a cute little piglet was impossible to resist. Little did he know, that decision would change his and Derek’s lives forever. Esther turned out to be beyond adorable but there was nothing ‘micro’ about her, and Steve and Derek realised that they had signed on to raise a blooming full-sized pig. Within three years, tiny Esther tipped the scales at a whopping 270 kilograms. After some growing pains and a lot of pig-sized messes, Steve and Derek made another life-changing decision: they bought a farm and founded the Happily Ever Esther Farm Sanctuary, where they could care for Esther and other animals in need. 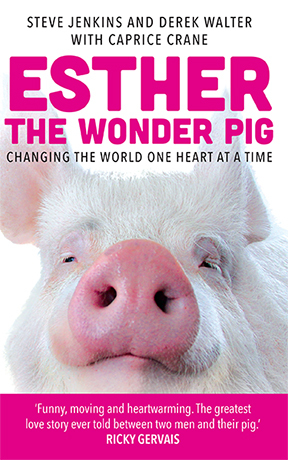 Esther the Wonder Pig follows Steve and Derek’s excellent adventure – from reluctant pig parents to two of the world’s most successful and beloved animal rights activists, alongside the magnificent Esther, a social media star with millions of fans around the globe.